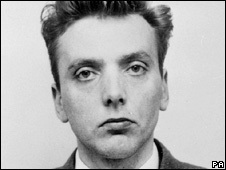 The mother of the last undiscovered victim of the Moors Murderers has begged Ian Brady to reveal where he is after police called off their search. Keith Bennett's mother Winnie Johnson said she was "disappointed" Greater Manchester Police had called off the hunt for his body on Saddleworth Moor. Police said they had "exhausted all the avenues" available to them. 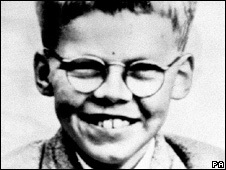 The 12-year-old was picked up by Ian Brady and Myra Hindley in Longsight in June 1964. Mrs Johnson said: "I want Keith found before anything happens to me because I want to give him a decent burial. "It's a nightmare, it's been a nightmare for the last 45 years how I have carried on - 45 years in limbo. Winnie Johnson: "It's still not too late"
"He knows where he is and won't tell anyone." Appealing directly to the killer she pleaded with him to reveal where her son's body was hidden. "I'm pleading with him to get to me or the press or the police and tell me where Keith is, it is the last time it will be done," she said. "I appreciate what the police have done, they can't do anymore they have got nowhere else to look - it is up to Brady now to do what he can for me to get Keith back. "If I could speak to him now I would wring his bloody neck, but they will not let me see him." Liverpool lawyer David Kirwan, who represents Mrs Johnson, added the family was disappointed the police search had been called off. He appealed to Brady "to bring to an end the appalling ordeal Keith's mother has endured all these years". Det Ch Supt Steve Heywood said: "The Moors Murders have cast a long and dark shadow over the history of our region. "We had all hoped that we would find the body of that little boy who was taken so cruelly away all those years ago and finally allow his family to lay him to rest. "Sadly we have not found his body and we reluctantly have to say that, for now, we have exhausted all of the avenues available to us. "In the end, one man holds the key to where Keith Bennett's body is. "One act of humanity would help Winnie find some peace and allow her to give her son the burial she so desperately wants." A search of Saddleworth Moor in 2008 tried to match up photos taken by Hindley and Brady with aerial shots of the moor in an attempt to find him. The investigation into the boy's disappearance has been classified as dormant by GMP. The force says only a major scientific breakthrough or fresh evidence would see the hunt for his body restart. Brady is held at Ashworth High Security Hospital in Merseyside. He was convicted in 1966 of murdering 10-year-old Lesley Ann Downey, Edward Evans, 17, and 12-year-old John Kilbride. The judge imposed three concurrent life sentences on Brady, then aged 28, for what he called "three calculated, cruel, cold-blooded murders". In 1987 Hindley and Brady confessed to killing Keith Bennett and Pauline Reade, aged 16. Police managed to locate the remains of Pauline Reade but, despite many weeks of digging, they were unable to find Keith's body. Scientists believed that, due to the nature of the soil on the moors, it would be likely that some of the 12-year-old's remains would still be preserved. The investigation also called on the resources of, among others, clinical psychologists, imagery experts, search advisors, geologists, geophysicists, geochemists, archaeologists and anthropologists. Hindley died in Highpoint Prison, in Suffolk in November 2002, after a long and unsuccessful bid to be released.